This print captures the moment when a hummingbird's many colors sparkle as they float on the wind. Like flying jewels, hummingbirds provide unmatched fascination and intrigue as they flit from flower to flower, the sunlight revealing their gorgeous, iridescent plumage. Sarah Janece Garcia's artwork captures the magical moment when a hummingbird's many colors sparkle as they create the illusion of floating weightlessly on the wind. To accomplish this fantastic feat, hummingbirds must move their wings forward and backward in a repeated figure eight which gives these tiny creatures a dazzling amount of power. Designed in San Antonio, Texas. Printed and framed in Portland, Oregon. I purchased this picture for myself a few months ago. It is truly beautiful and makes me smile every time I look at it! The colors are vibrant, and the abstract lines bring the little hummingbird to life. I like it so much that I had to get one for my sister for her birthday. She was thrilled when she received it and found the perfect spot for it. Absolutely no surprises, the colors were as vivid as the site indicated. I have mine in the kitchen nook by the bird feeder so I can see the real thing and the print waiting for Spring and the return of our hummingbirds! HAPPY AND I KNOW IT! 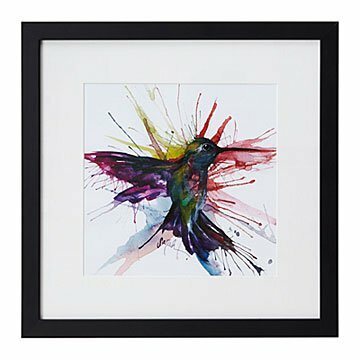 Every visitor has LOVED our hummingbird print! We placed our hummingbird print in a group of wall hangings in our loft apartment. Every friend and family member who have come to our home have commented on what a great print it is. It is beautiful -- I love it! We placed this vibrant art piece in our great room. Our family loves it. Love this piece of artwork! Vibrant colors that go well in any room! Size of this print ?